Although the aqueous electroless etching (AEE) method has received significant attention for the fabrication of silicon nanowires (SiNWs) due to its simplicity and effectiveness, SiNWs grown via the AEE method have a drawback in that their surface roughness is considerably high. Thus, we fabricated surface-modified p–n + junction SiNWs grown by AEE, wherein the surface roughness was reduced by a sequential processes of oxide growth using the rapid thermal oxidation (RTO) cycling process and oxide removal with a hydrofluoric acid solution. High-resolution transmission electron microscopy analysis confirmed that the surface roughness of the modified SiNWs was significantly decreased compared with that of the as-fabricated SiNWs. 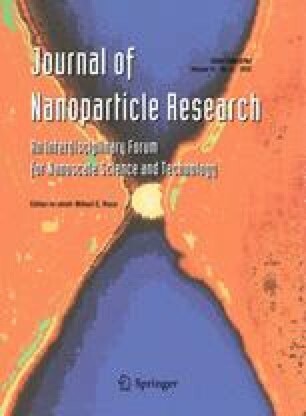 After RTO treatment, the wettability of the SiNWs had dramatically changed from superhydrophilic to superhydrophobic, which can be attributed to the formation of siloxane groups on the native oxide/SiNW surfaces and the effect of the nanoscale structure. Due to the enhancement in surface carrier mobility, the current density of the surface-modified p–n + junction SiNWs was approximately 6.3-fold greater than that of the as-fabricated sample at a forward bias of 4 V. Meanwhile, the photocurrent density of the surface-modified p–n + junction SiNWs was considerably decreased as a result of the decreases in the light absorption area, light absorption volume, and light scattering. This study was supported in part by the Priority Research Centers Program through the National Research Foundation of Korea (NRF) funded by the Ministry of Education, Science and Technology (MEST) (2009-0093823) and the Converging Research Center Program through the Ministry of Education, Science and Technology (2011K000631). This study was also supported by the KARI-University Partnership program and an appointment to Mid-career Researcher Program at the NRF administered by the MEST (2009-0080290).